Disclaimer: I was invited to dine at the bistro. All food and wine were paid by the hotel management. The food is reviewed honestly with my genuine thoughts. Going along the Diagonal Rd towards Marion shopping center, one can easily find a huge land mark building in the corner of Prunus St. 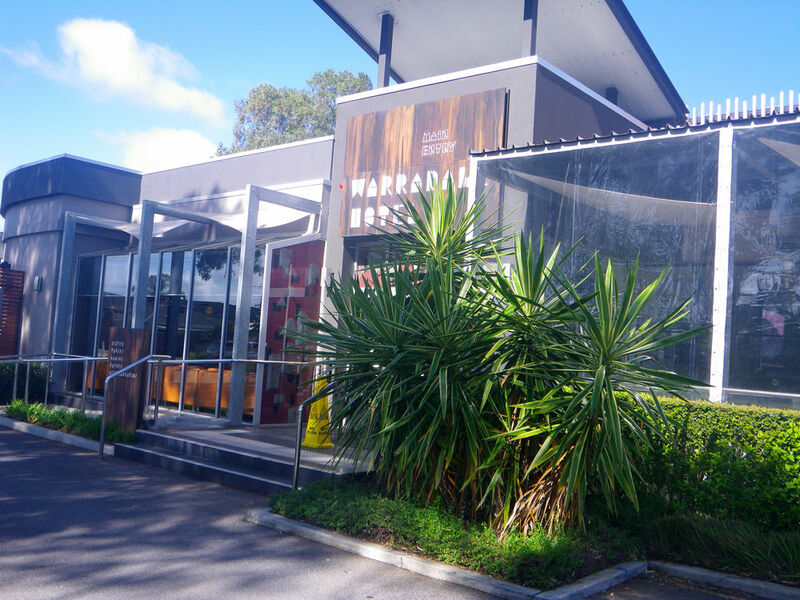 The Warradale hotel was opened in 1963 to accommodate the changes in the community. From farms and vineyards, the warradale suburb has evolved a lot nowadays but the hotel has long been a icon in the area. In 2012, the hotel underwent an extensive renovation and a new bottle shop, three new bars and a new bistro was created. In response to the renovation, the hotel’s customers and trade has increased dramatically and in 2013, this newly renovated hospitality icon has won three prestigious awards from the annual AHA/SA Awards for Excellence, including the Best Redeveloped Hotel, Best outdoor or Non-enclosed Facility and the Best Bistro/Casual Dining – Metropolitan. The hotel sits in a park view area, surrounded by various plantations and a beautiful small parkland. Once entering the hotel from main entrance and passing a bar area, the bistro was clearly observed. 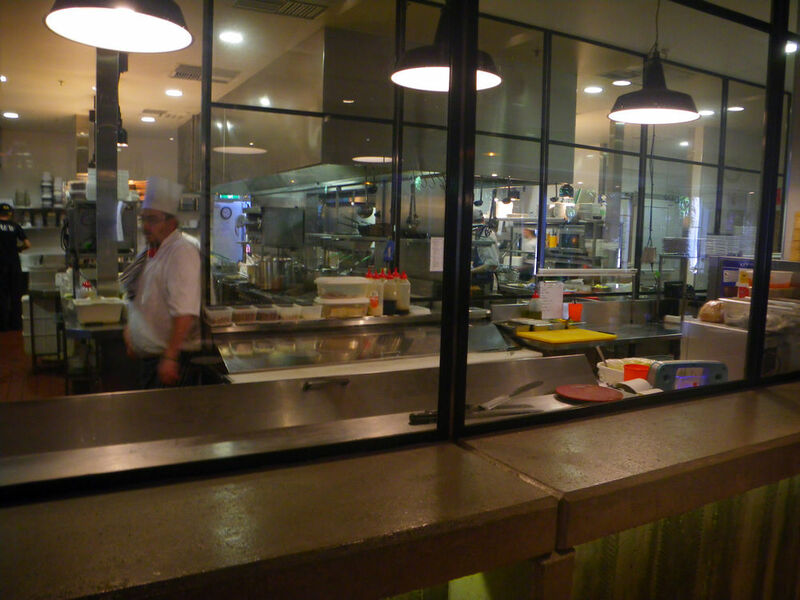 There was also the open kitchen where diners can watch the chefs doing their job. The head chef of the bistro, Gary Rule, who used to lead the Stirling Hotel, has created dishes to illustrate the freshness and rustic style with a focus on local SA produces. 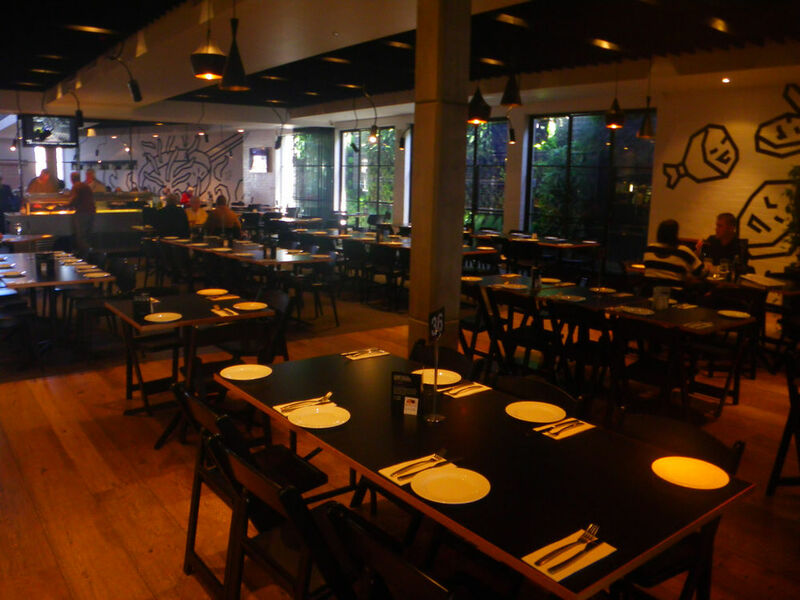 The menu of the bistro consists of standard pub fares while having many dishes that will normally show at some fine dining restaurants. Like most pub bistros, the daily specials were written on the blackboard. This mixture in dishes can satisfy diners with different needs while the extensive wine menu has really fired me up before ordering our meals. 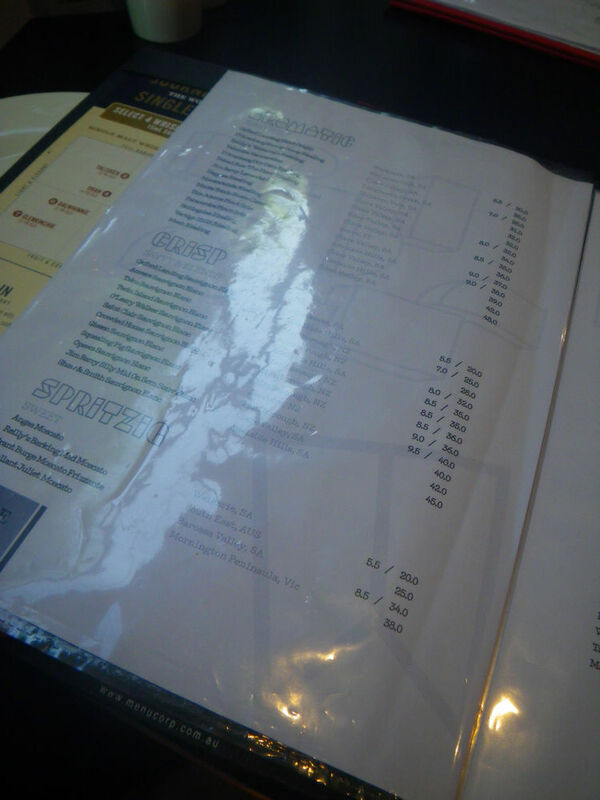 The wine list contained several pages of locally produced wines and some liquors such as whiskey. The prices the main dishes range from high 20s to mid 30s while the pub fares are priced around $20. Most of the wines are able to be ordered by glass or by bottles with reasonable prices. At our arrival around 12:30 pm, the right part of the bistro was already filled with diners. Considering it was a Monday, this place must be doing something right to attract local residents and workers. We were greeted with our lovely waitress, Michelle. In our conversations later on, I discovered that she had broad knowledge about their menu and their source of ingredients! Well done! The service for today was definitely a top notch and all requirements were catered. Since my wife can’t eat anything dairy or nutty, Michelle has taken special notice about this when introducing their food etc. 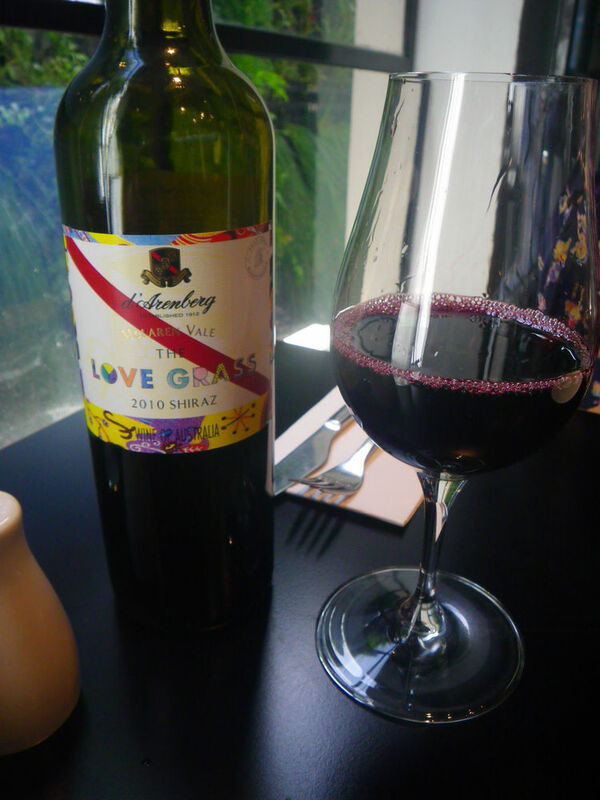 To start up the lunch, we ordered a bottle of 2010 d’Arenberg The Love Grass Shiraz. I have been a fan of d’Arenberg Noble 1 sticky for many years and absolutely enjoyed their other wines. 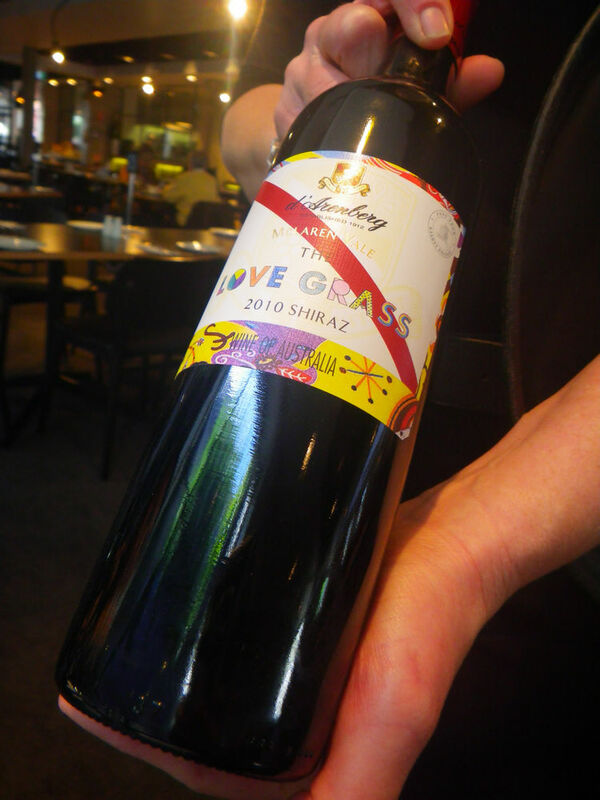 The love grass shiraz is a blend with 85% shiraz and the rest contains a bunch of other grape varieties. The grapes are sourced from vineyards around d’Arenberg. These vineyards often had the weed grass attached to the vines. This wine is exclusively available at the Cellar Door and some restaurants. On nose, the wine was complex with pepper, floral and roasted coffee nut aroma. However, on palate, the wine was quite fruity with raspberry and earthy spices. The sugar level was well balanced. For the starters, we ordered their oysters both natural and Kilpatrick. Although there was not a huge selection of oyster dishes to choose from, these two dishes really caught my attention. I love fresh natural oysters while my wife is a big fan of Kilpatrick. The natural oysters ($7.50) were so fresh! I was able to taste the sweetness and the fantastic seafood flavour in them. 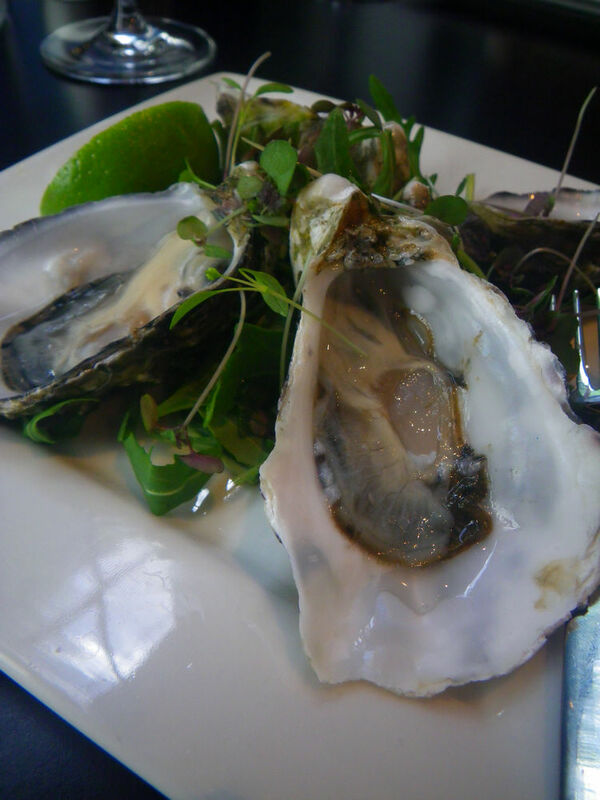 The oysters were sourced from Smokey Bay, one of the premium oyster producing regions. The oysters were quite big but have kept all the essence in the meat and once entering the mouth, the sweetness as from springs just released into the mouth. While enjoying the natural fresh oysters, bites of a rocket or two can definitely bring the oysters to a new level as the bitterness actually went neutralized with the sweetness. The price for these oysters was quite reasonable, considering many places now charge $3.00 for each oyster. 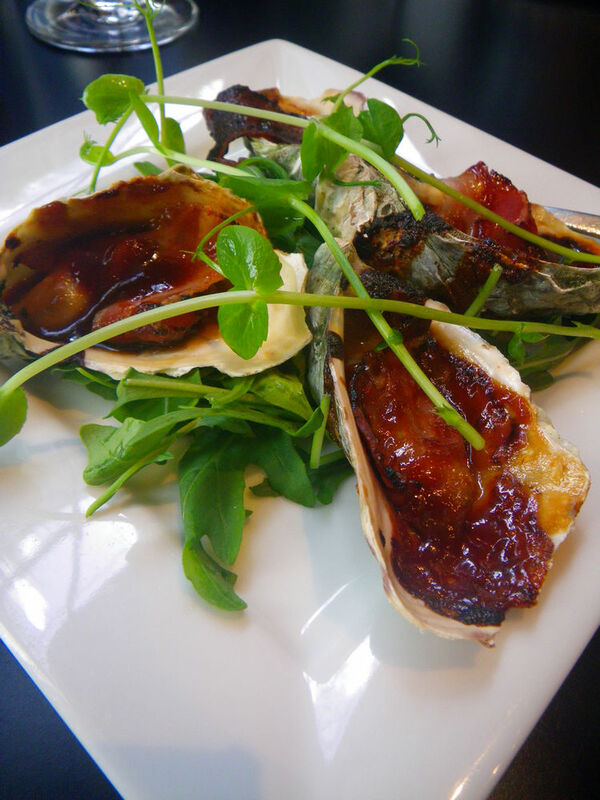 The kilpatrick oysters ($9.00) were done with smoked speck and spicy bbq sauce. Oyster kilpatrick, sometime referred to as oyster Kirkpatrick, is a traditional English specialty, made with bacon, cheese and Worcester sauce. However, this dish has evolved a lot in the modern culinary concepts. While I am sure everyone has enjoyed this dish at some point in their life, the ingredients now are quite different from the original recipe. Anyway, I like this dish. Smoked specks are something I use for cooking all the time but I never applied them to this dish. The bbq sauce was spicy, salty and tasty, while strong smokiness was experienced from the specks. The oysters went down the throat within seconds and out entrees were due to come soon. For entree, I had Duck liver parfait while the wife enjoyed the sourdough Bruschetta. 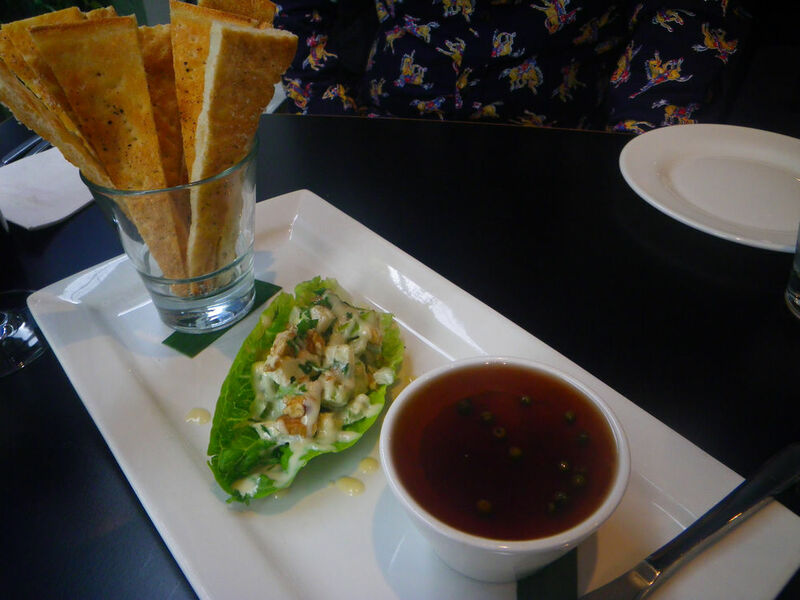 Duck Liver Parfait, topped with port wine jelly, apple & celery waldorf salad & warm flat bread, $14. While everything else in this dish tasted perfectly fine, I especially loved the combination of the port wine jelly and the liver parfait. For parfait dishes, they normally come with a jelly on top but the jelly in this dish has complemented the parfait so well. The sweetness and the slight complex spiciness of a port wine combined perfectly with the parfait and because of the jelly, once biting the parfait, they started melting the mouth. The waldorf salad just added some refreshing effects to the game and so rich parfait. I wasn’t even able to finish the dish as it was too rich and filled my stomach really quickly. 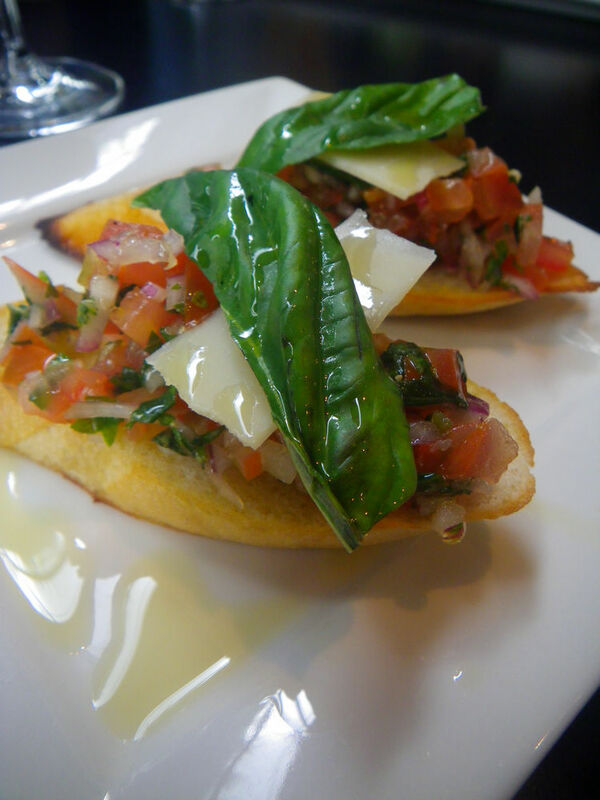 Grilled Sourdough Bruschetta, topped with roma tomato, basil, spanish onion & shaved parmesan, $6.0 for 2. Before ordering the dish, our lovely waitress Michelle suggested the smoked salmon bruschetta, but I thought we were having many rich flavoured dishes, it was better to keep the entree light. Even the normal bruschetta was a good choice. The roma tomato salsa was so refreshing and that small amount of olive oil really reduced the total flavour in the mouth, making us ready for our mains to come. For the mains, to best illustrate the freshness and the techniques of the chefs, nothing would be better than seafood and game meat. Hence, we ordered their seafood grill and kangaroo grill. Both of the dishes turned out to be very nice. This is a seriously good seafood grill. 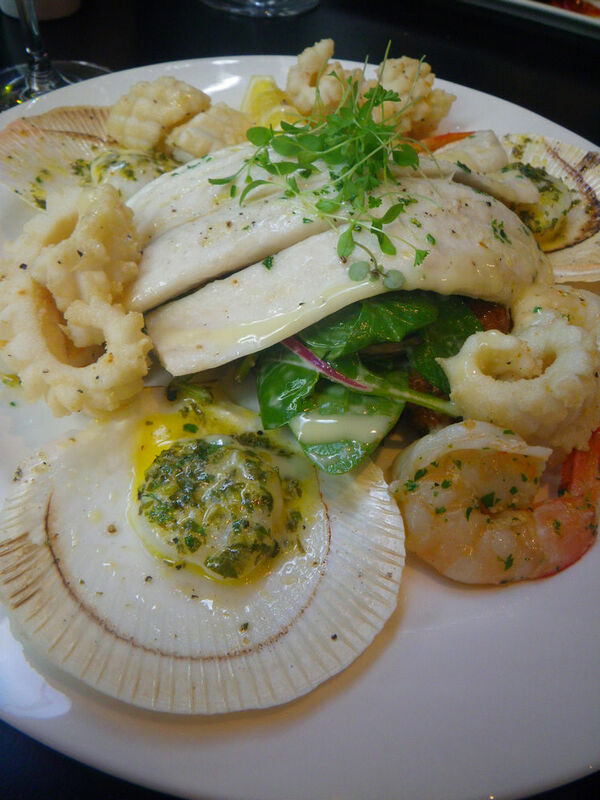 The dish consisted of 1 King George Whiting, 3 Spencer Gulf prawns, 3 half shell scallop & some salt ‘n’ pepper squid. The salad was a warm kipfler potato, baby spinach and Spanish onion salad. The seafood were so fresh! The fleshes of prawns and the scallops were nicely cooked and were tender. Although the scallops were not the best I’ve ever had, they generally tasted good. Strong fresh seafood flavours was tasted on palate while the salt and pepper squid introduced some saltiness and spices. The grilled King George Whiting fillet was cooked just right and the presentation of the dish made my wife wanting to eat more. Delicious! 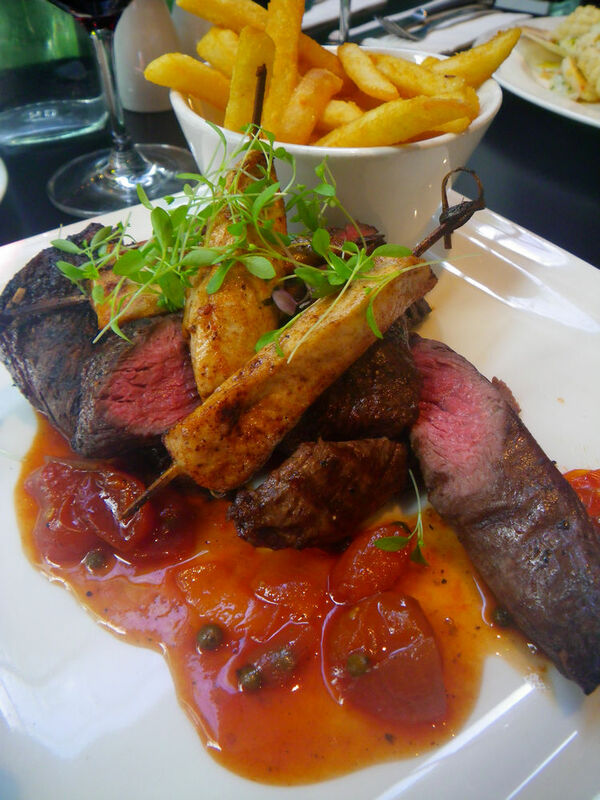 This is a mixed grill. When thinking pub grills, what would be your image? 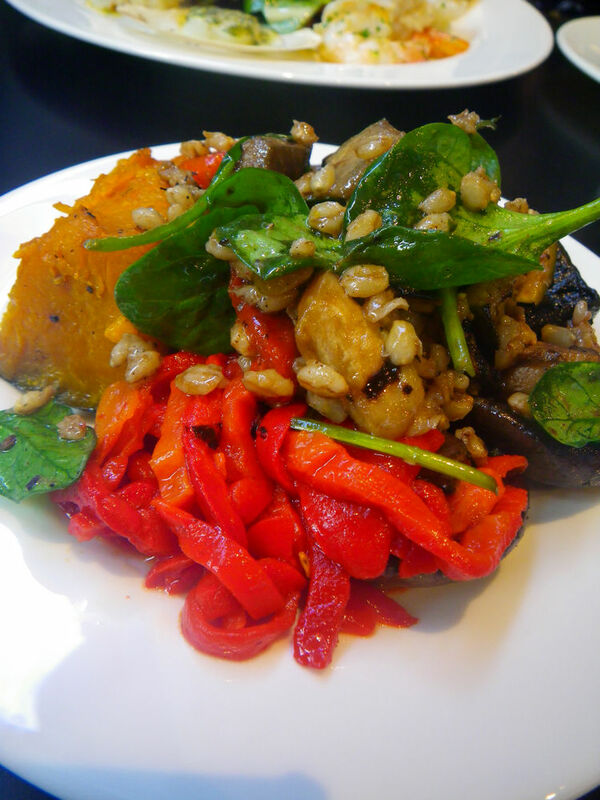 However, this dish was done with a higher quality. I was almost can’t taste the game flavour of kangaroo and the lamb. While both of the meat were cooked medium rare, their mouthfeel can be described as tender, moist and full of flavours. I didn’t even add salt to the meat and they just went flavourful. The roasted cherry tomato & green peppercorn ketchup contributed some strong spiciness and a hint of sweet and sour flavour to the overall dish. These extra flavours helped to promote the flavour of the two meat nicely. Not to mention that the wine we selected matched this dish extremely well due to the peppery and fruity taste. The good quality of the meat came from the fact that all their meat were aged for 30 days before serving according to the bistro menu. 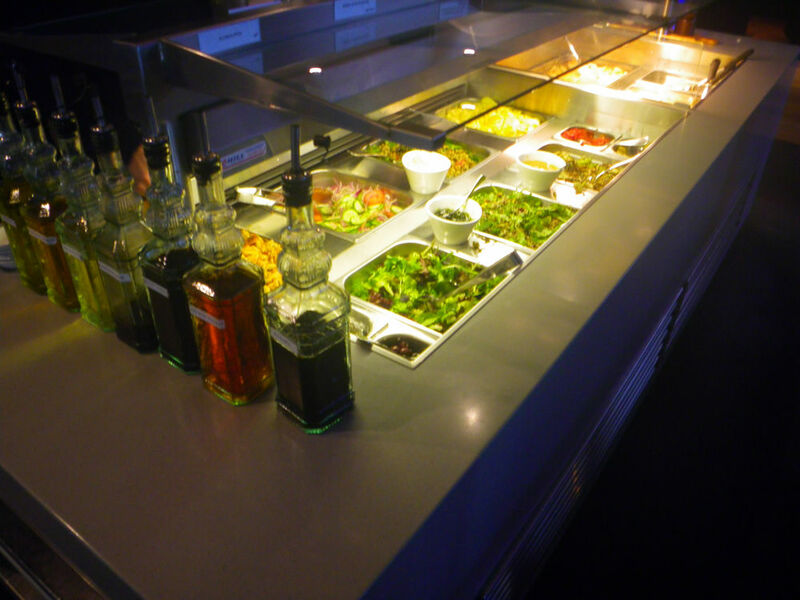 In the center of the bistro was located a salad bar that provides a number of pub salad items to diners. Out of them all, I enjoyed the mushrooms a lot as they were roasted just about right with good flavour. Now, up to this point, my wife has been almost full and I was nearly there. The desserts were coming after we rested for about 10 minutes. The bistro offers a range of sweet dessert options. Initially, the wife ordered Dark chocolate creme brulee. Now, I would like to thank our Michelle again because she went to the kitchen and checked that the dish contained half milk chocolate. Since my wife is allergic to dairy products, we changed to a small serve of dark chocolate fondue. 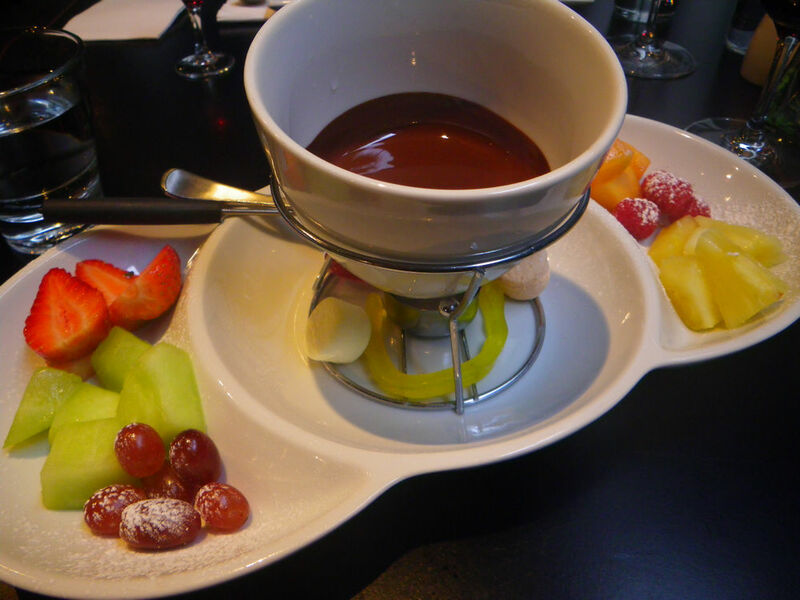 The dish came with dark chocolate and a number of seasonal fresh fruits as shown in the above picture. The two small marshmallow and snake jellies are cute, aren’t they?! 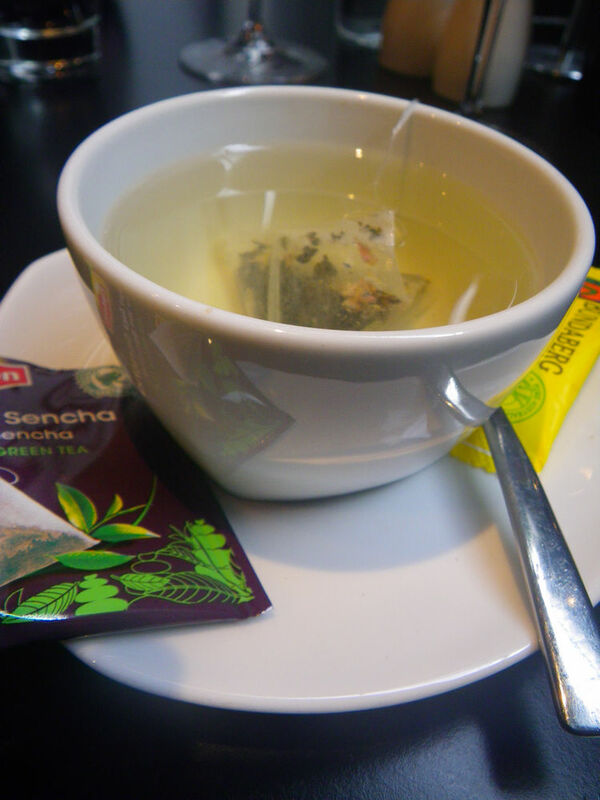 The sweetness and bitterness were neutralised by the fruity green Sencha. My dessert was their special dessert at the moment. Every single element in this dish was well done. I had really soggy sticky date puddings before and that’s why I don’t like them, but this dish changed my mind. 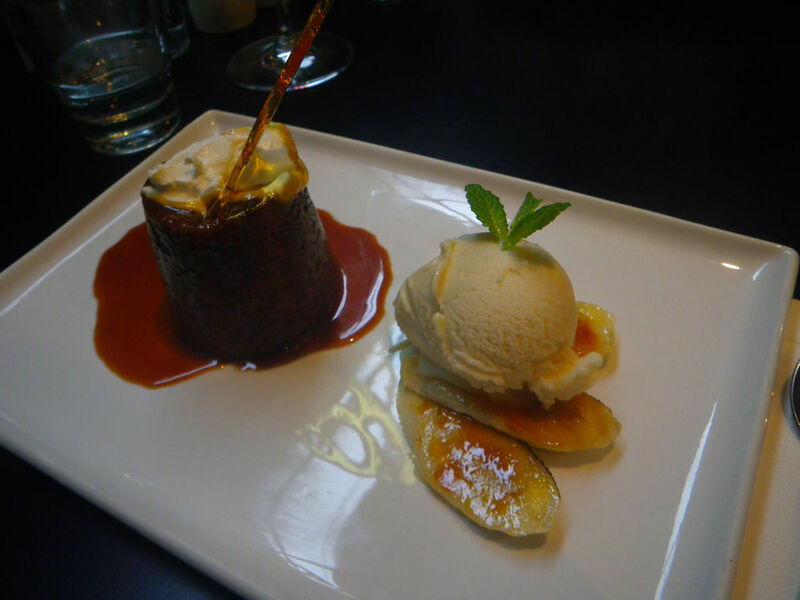 The pudding had very good structure and texture while the caramelised bananas were sweet and crispy. The banana ice cream cleansed the palate and left me a pleasant flavour for the rest of the day. 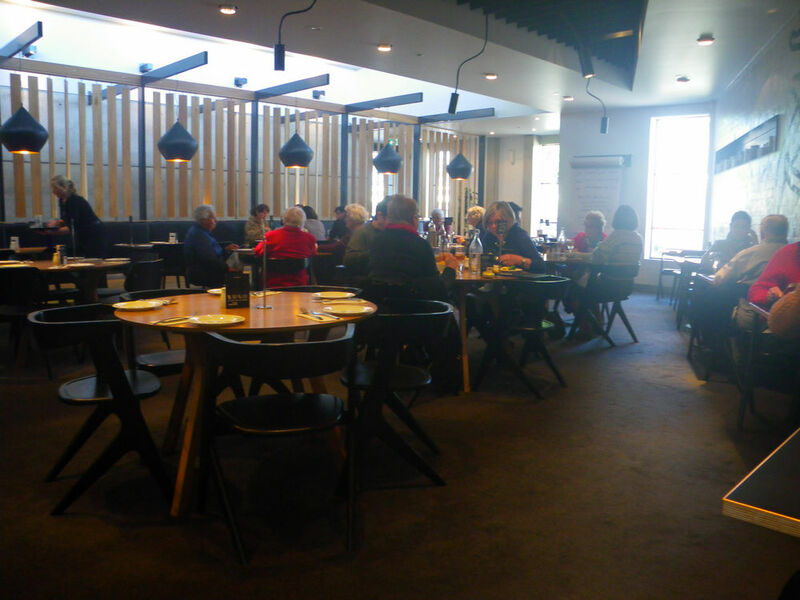 Overall, we pretty much enjoyed the lunch at Warradale Hotel Bistro and I am sure the awards do tell people something about the place. Is this the best bistro in SA? In 2013, I’d say yes but I am looking forward to see more awards to be won by the place, including the national AHA awards in October this year in Canberra. On our way out, we observed this chocolate fountain. Glorious! What a feast you had! I am getting hungry whenever I read your posts. That seafood platter looks huge to me. I would be so full if finishing it by my own. 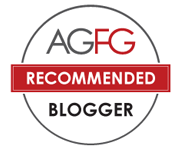 Getting hungry is indeed a good thing and that’s what the blog is here for, isn’t it? lol. The serves are huge at this place and ppl with a small belly can definitely be feeded well with an entree and a main. My grandma is a fan of this place! We went there a couple of times this year. Nice meals served. Yes Jess, exactly right. Good quality meals and there were many elder people dining there too. G’day and WHAT huge size portions for mains Xin, true! Congrats to you and Tina making it to dessert too! Exactly! Normally I dont eat much desserts but their stuffs sound promising. lol The mains are indeed huge! How would I know this is not an ad? You got invited for dinning and can just give good words about a place! Hi Natalie. I think this is a question that many people want to ask. I am professional in blogging about food and I respect my professionalism. Hence, all reviews are written with careful consideration of my own experience. If I don’t like place, I will not state that I like it. 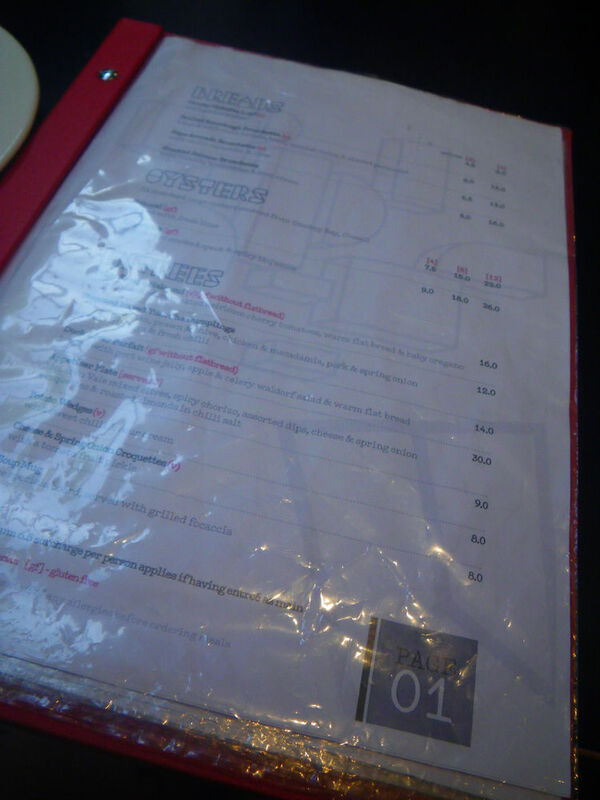 However, if a restaurant is genuinely good, I’ll definitely blog about it. Hope this clarifies a bit. Definitely give it a go and I am sure you won’t be disappointed!